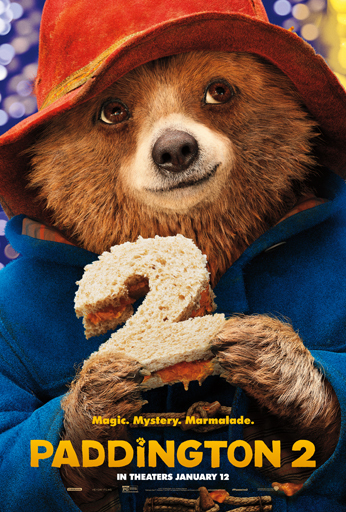 In 2015’s Paddington, as well as in this year’s sumptuous, somehow even sweeter sequel, the titular little bear draped in his trademark blue duffle coat and bright red hat churns out marmalade for the masses, and I have to believe that the sticky substance is the story’s well-received attempt to glue goodness to our hearts. The effort works emphatically, earning its distinctions as not only one of the most charming family oriented stories that I’ve seen in recent years, but as a film for all ages, to watch and admire and rekindle their inner flame of kindness should it have been unrightfully blown out. 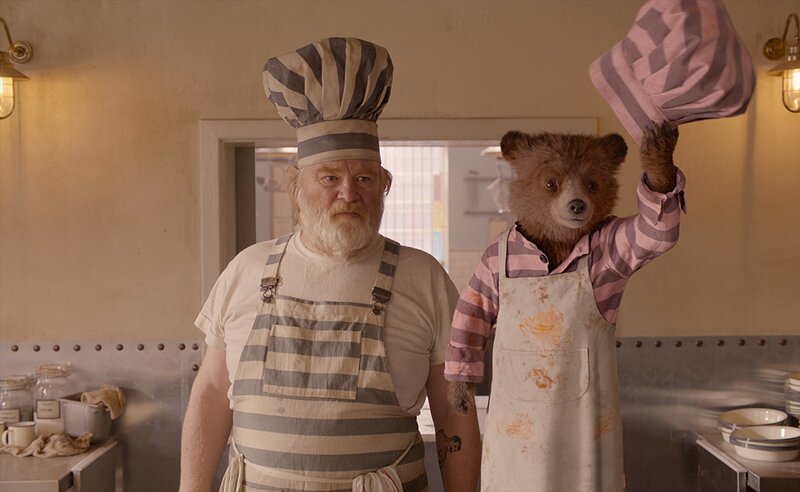 Paddington 2 is like a delicious birthday with a minefield of candles; instead of huffing and puffing to make a wish, it happily lops off the best parts of itself for us to feel good, and it’s a regenerative gift that keeps on giving. Surprisingly, Paddington 2 opens by adding rich detail to the original, showing us a daring rescue mission by Uncle Pastuzo (Michael Gambon) and Aunt Lucy (Imelda Staunton) to save a young Paddington from sure death. Their dream of a trip to London has been indefinitely postponed. Why? “Because we have a cub to raise,” Aunt Lucy says, her maternal voice abandoning their hopeful endeavor with nary a second of selfish thought. Flash forward to today and Paddington (Ben Whishaw) is living with the Brown family, has introduced himself to the neighbors on the street, writes to Aunt Lucy about his life in London. 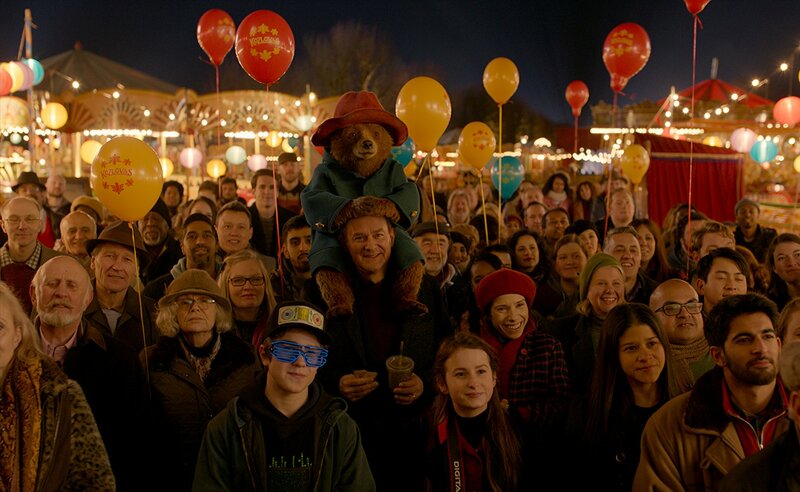 A few years ago, Paddington fulfilled the hallmarks of most family films by being a movie about finding a place to call home in this world. Paddington 2 raises the limbo bar by comparison, allowing its klutz to scamper around and ruin things without wasting the overhead budget’s bottom line. This film tiptoes and dangles beneath that fine breaking point – bordering on absurdity and refusing strict genre classifications – without going past the breaking point. Few PG films are given this much attention to detail. Paddington 2 features some Charlie Chaplin / Buster Keaton inspired physical humor, uses its obscure British nature to great effect, and never belies the sort of shape-shifting Peter Sellers bad guy who rummages around the story’s affairs. 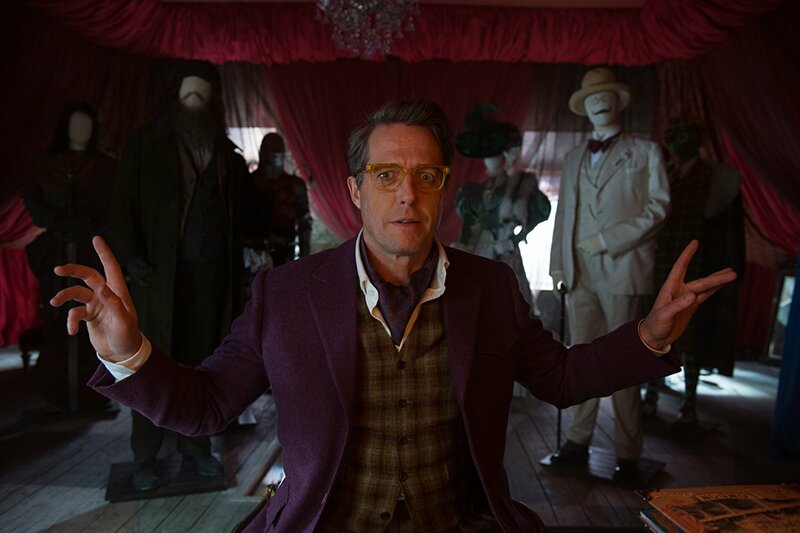 He’s Phoenix Buchanan (Hugh Grant, delightful as ever), an aging and forgotten actor whose name suggests a figure rising from the ashes of his own fame and fortune to reclaim good-will. Buchanan is a vaudevillian scam artist, a sham, an unprincipled wart who seeks the limelight and turns to crime with hopes of earning it once more. While Buchanan loots the city for clues to the location of a great fortune, Paddington is mistakenly put behind bars for a crime he didn’t commit, and as per usual, his good-hearted nature forces the surroundings to adjust to his countless, effortless pleasantries, not least of which comes from Knuckles McGinty (Bredndan Gleeson), a bad chef moonlighting as a tasteless disciplinarian. What’s so downright pleasant about Paddington 2 is that the film doesn’t allow itself to be defined bit its multiple anxieties. There are blips of histrionics and some outlandish behavior, but this story is swaddled in a freshly washed, 1800 thread-count duvet of diverse kindness. 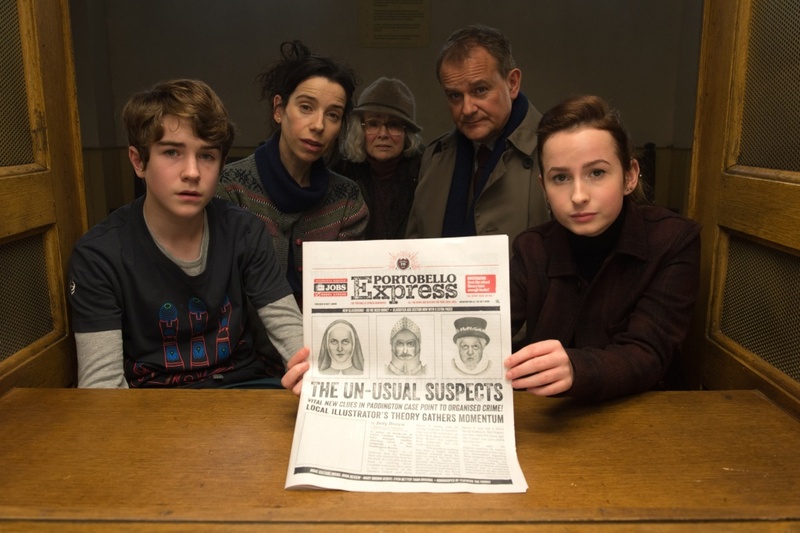 The cast – led by a Judy Bloom performance from Sally Hawkins and a conniving chameleon from Grant – all work wonders with their intelligently written characters. Most notably though, director Paul King and co-writer Simon Farnaby have crafted a story largely missing the predictability of script pieces such as “dark night of the soul” and the inevitable “all is lost” moment. They’re there, although vastly less unimportant than the norm, because this is a tall tale about a little bear who swallows his dreary surroundings through a straw of optimism. Paddington is tiny, and even when his gigantic heart draws the short straw, you know the adversity will be met with positivity. Paddington 2 cuts through all of the static noise and the hullabaloo and the outrageous stupidity of modern politics by literally adopting the importance of strong character and honest integrity in all people, and it’s a great film because Paddington (voiced with blind compassion by Ben Whishaw) still sees in color. He sees complexity, richness, defies the laws of hibernation in order to – in cases especially relevant to today – pass encouraging judgement on any and all. By merit and by virtue, Paddington is an uncanonized and fictitious figure who, in the same spirit of Santa, rejects hate and accepts all that is good and just and right. I have no idea how a movie led by a GCI character who lives under the rules of Murphy’s Law somehow finds so much upswing, so much tempo, and wastes so little time in the minutia of cursory drama. Paddington 2 is a blessing.